Three Nobel laureates, Elinor Ostrom, Joseph Stiglitz and Amartya Sen contributed to the World Bank’s Social Capital Initative in 1999. 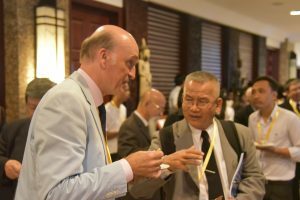 Unfortunately the group has been „disbanded“ – that’s how Michael Woolcock, the head of the initiative, expressed it in an email to Alexander Dill of the Basel Institute in November 2015. Recently the World Bank on the occasion of the World Social Capital Monitor recovered the issue. 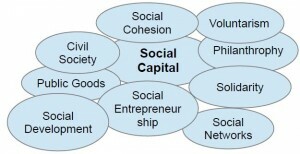 In their report to the European Commission (p. 186) Stiglitz and Sen wrote 2009: „Bridging social capital is the most important under-measured form of social connections for many outcomes.“ But Joseph Stiglitz as well wrote: „Social capital is tacit knowledge“. So why did it not happen? Why are so many organizations and Statistical Offices not interested in measuring and considering Social Capital? The major reason is the reaction policy makers and officials have on what they suppose to being academic in any meaning: Let’s leave this to specialists and report in three years again. Violent conflicts can only be resolved by trust, helpfulness and friendliness. Public goods such as security, health, education and climate care can only be funded if the citizens support them by taxes, contributions and voluntarism. Sovereign debt can only be repaid by the willingness of citizens to accept austerity measures and an asset levy. For both trust and solidarity are required. Affluence grows by people trusting and helping each other. Otherwise the transaction costs will be too high and will prohibit economical relations. How can bridging Social Capital being measured then? The only eight questions of the Social Capital Assessment are available in several languages on www.trustyourplace, the survey portal of the Basel Institute of Commons and Economics. We offer a social media application to identify, to enhance, to protect and to recover core assets of Social Capital. The participation is anonymous and we neither require registration nor do we collect any socio-demographic data such as on political, ethnic or religious bonding. Why? Because in most of the conflict regions they are the reason of the conflict. Social Capital in our definition is the amount of core interpersonal perceptions among a community. In our Social Capital Assessment we are now able to quantify and to compare the Social Capital of around 150 countries today. Of course Social Capital cuts across with a bundle of issues such as social cohesion, voluntarism, public goods and civil society. If we you want to learn more on Social Capital, it’s history and contributors, our recent introduction „Why Social Capital 2016?“ might be an easy way to access. The major references are linked in the article so that you can make your own picture of the major sources.